It’s two weeks before Christmas and I know that I have been madly, sometimes obsessively thinking of what wonderful morsels to make for our family celebration, and I have no doubt all you foodies have been doing the same thing. I love this time of year, with all the Christmas cooking shows on the TV, especially Jamie Oliver’s specials. He gives me hope that all the stress and panic on what to feed everyone will be perfect on the day. Christmas dishes are always about comfort and flavour – and seriously, when isn’t it ever about the food! Celebration food evokes such happy memories for me from when I was kid, when I got married and the many great meals I have had out with my husband. Latkes are a Jewish recipe that are made during Chanukah (sometimes called the festival of light). They are so good you can make them all year around. 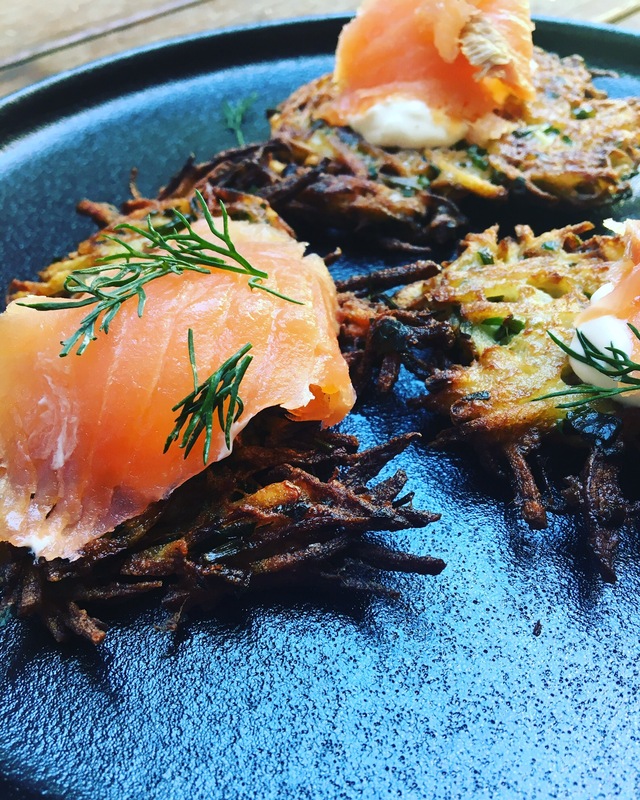 I played around with a Latke recipe that I have had for years the other week to use in place of the usual blini you use with smoked salmon and sour cream as an appetiser and they were amazing. They will be a feature on our Christmas or even Boxing Day table this year and I hope that you give them a try too. Peel and grate the potatoes. Place in a colander for 20 minutes to drain. Place the potato mix into a clean tea towel and squeeze the excess moisture out until almost dry. Place the potato into a large mixing bowl with the remaining ingredients and mix really well. Preheat your oven to around 160C. Place a large frypan onto the stove and add in enough oil to the pan to around 2cm deep. Heat on high. When the oil is hot, carefully add 1/4 cup measures into the pan to make a small round, flatten out. Cook over a medium heat on either side until golden brown and crispy. Drain onto paper towel and place in the oven on a try with a rack to keep warm. Continue cooking until all the mixture is gone. Serve with your favourite toppings. They work really well with sour cream, or creme fraiche with smoked salmon and a spring of dill.